The regular NFL season advertiser continues its social strategy for the big game. On Feb. 5, the Patriots and Falcons will face off in Super Bowl LI, and a new social campaign will allow select fans to cheer them on via the largest screen in the stadium. Bose is working with 360i to bring back the brand’s #LetsHearIt campaign from last year’s Super Bowl, but in a much larger way. This year, Bose is encouraging Atlanta Falcons and New England Patriots fans to upload video of themselves performing their team’s chants on Facebook, Instagram and Twitter using the hashtag #LetsHearIt. The brand, an official sponsor of the NFL since 2014, will then craft a montage those videos that will be played on the Jumbotron at NRG Stadium during player warm-ups. "The idea is to let the fans send messages to get closer to the players and the game that they love," said Andrea Harrison, Bose’s global head of digital and social platforms. "Given the agility of mobile phone, video and the way people love to get themselves up on the screen, we thought, let’s turn this into a crowdsourced cheer video that we could bring to the players." The #LetsHearIt campaign originated during last year’s Super Bowl, the first time Bose decided to approach the event with a social-first campaign. In 2016, the brand worked with 360i to transform fans’ tweets into lyrics for mini music videos. These tweets were set against a variety of music including country, gospel and even Norwegian metal. While Bose advertises TV spots during the regular NFL season, it has never broadcast an ad in the Super Bowl. But this year, the #LetsHearIt campaign ties into Bose’s new "Get Closer" campaign, which launched in October. Whereas the idea behind the original campaign is that Bose makes products that get music lovers closer to their music, #LetsHeartIt is all about getting fans closer to football. 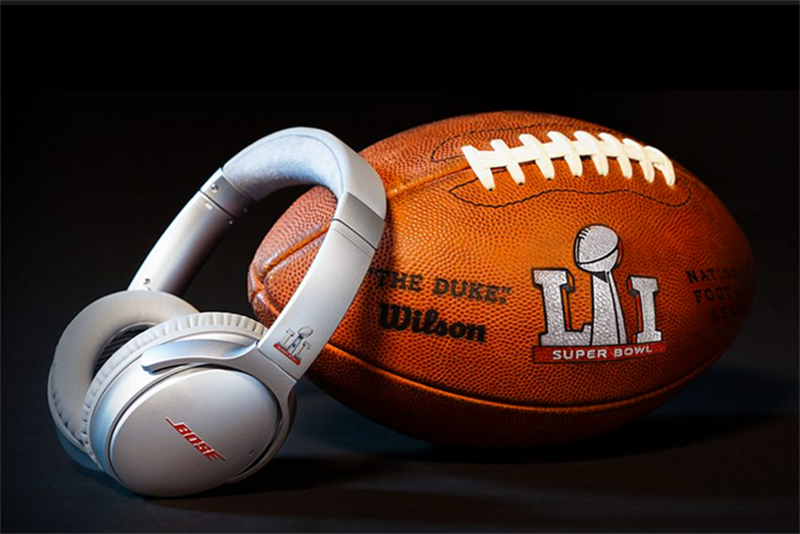 "We wanted to carry on that social-first, participation-driven campaign," said Harrison, "but we wanted it to ladder up to our brand platform ‘Get Closer.’"
To that end, Bose is also concentrating on connecting fans to their favorite sports stars on social. The brand is working with 360i, Creative Artists Agency, MediaHub and iHeartRadio to promote the campaign with influencers, celebrities and football players like retired Boston Red Sox slugger David Ortiz and Atlanta Falcons running back Devonta Freeman. Bose launched the campaign last Thursday right before the final playoff games. Naturally, this means that those who created cheer videos for The Steelers and the Green Bay Packers will not be appearing on the Jumbotron. But even the fans who don’t get their videos on the big screen can still win a pair of Bose QC35 headphones, usually priced at $349.95. According to Harrison, the brand will be giving away 150 pairs to those who participate. The brand also plans on using the videos once Super Bowl Sunday is over in a message thanking fans of the winning team. Precisely what that will look like, Harrison won’t say. "That’s the beauty of having deliverables like these crowdsourced videos," said Harrison, "you can do a lot of different things with them." You can still buy a Super Bowl ad. Why?